Back up by request: Zoogz Rift "Ipecac" and "War Zone." David Bowie's death has rocked the world (as well it should), but let's not neglect to note the recent passing of another legend, albeit a very underground one: the genuinely unique, bizarre, and offensive performer known as Blowfly. As interviews attest, the man was a real character. I discovered the foul-mouthed funkster c. 1987, after stumbling across the album "Blowfly's Party" in a used record blowout sale (probably paid 50 cents at most) and wondered: what is the deal with this guy?! Some years before hip-hop got nasty and was still in it's bubblegum phase, this album featured such tunes as "Prick Rider" and "Can I Come In Your Mouth." As George Takei would say, "Oh my..." A few years later, I saw him, with Rudy Ray Moore opening, at Brendan Mullins' great post-Masque venue, the Club Lingerie, and it was the most star studded show I've ever been to. Seriously. Everywhere I looked, there was Stan Ridgway, one of the Bangles, Flea, Henry Rollins...had no idea Blowfly was such a cult figure. Little while later, he was opening for the Pixies at the height of their popularity. Crazy. Back in 2007, I reviewed on this here web-log his then-recent "Punk Rock Party" album he released on Alternative Tentacles records, which you can (and should) listen to HERE. It's amazing how he made a career out of the most vulgar, immature potty humor, performed in pseudo-superhero costumes. Even if you don't think he's that funny, you gotta respect that. A truly singular talent. 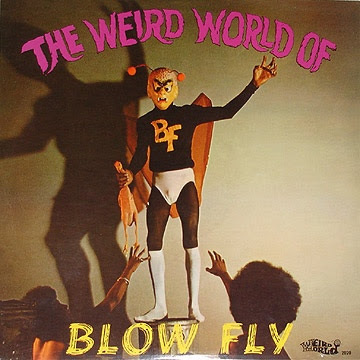 His first album, "The Weird World of Blowfly" is a great funk record - for those of you who don't find singing "My Baby Keeps Farting In My Face" to the tune of "Raindrops Keep Falling on My Head" funny, it really is enjoyable for it's musical merits alone. Recorded live before a properly unruly audience, the band doesn't quit, with each song seamlessly flowing into the next, a la James Brown's live medleys. Blowflys' singing is surprisingly decent. His crack band included Timmy Thomas on keys, who would have his own hit with the classic organ/primtive-drum-machine classic "Why Can't We Live Together," guitarist Little Beaver (love his "Party Down" album), and bassist George "Chocolate" Perry, who, oddly enough, played with Joe Walsh, Neil Young, and Stephen Stills. The follow-up interjects a little more comedic variety into the smutty-new-lyrics-to-hit-songs formula by framing the songs in tv show parodies. Good idea, but chopping up the tracks instead of letting it flow like the first album was not. Still, a worthy follow-up, with an almost as hot band. Both albums have a great live sleazy ambiance, like you're in the coolest basement nightclub or sweaty little bar and everybody's drunk and wild. And how 'bout them album covers? The obit for Clarence Reid, aka Blowfly (they made it one word, unlike the album cover) hit the New York Times today (Sunday Jan 24). According to the obit, 'Mr. Reid said he began making up his dirty songs as a child as a way of needling white people. "It backfired on me," he said. "Everyone else wanted to please the crackers. I wanted to make 'em mad." So, he regarded the success of Blow Fly as a sort of failure. Hey can you maybe re-up WATER by ZOOGZ, the first in the H20 trilogy? I "discovered" Blow Fly when I was a DJ at WBAB on Long Island around 1982 or so, when I also drove the WBAB Rock Stock race car at Islip Speedway. Everyone would bring out beer and "jungle juice" for the post-race pit parties, and I'd crank up my Blow Fly mixtapes (cassettes back then), and half the people would dance and laugh and the rest would blush and head for the hills!